On one of the last evenings of 2012, a man wanders into Demachi Masugata Shōtengai (出町桝形商店街), a 164 meter covered pedestrian shopping arcade in Demachi, a predominately residential area just beyond the Kyoto Imperial Palace, where the city’s urban core begins turning over to suburban outskirts. 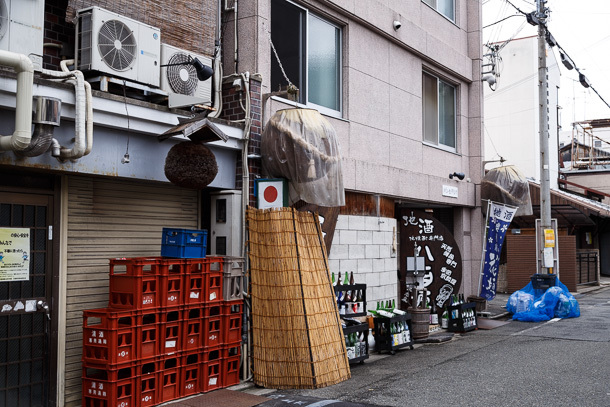 The man’s footing is unsteady, having spent the better part of the afternoon and evening eating and drinking his way around Demachiyanagi with friends. Lost in his thoughts, he is jolted into awareness by the unexpected sight of a crowd milling about the shōtengai, merchants putting their best efforts into moving old stock as the new year approaches. He looks up to see the hand-painted banners suspended from the arcade roof and is unexpectedly overcome with nostalgia. The sight triggers the childhood memory of similar scenes in the streets and arcades of the town where he was raised. As a young child, being part of the lively environment was an exhilarating experience. 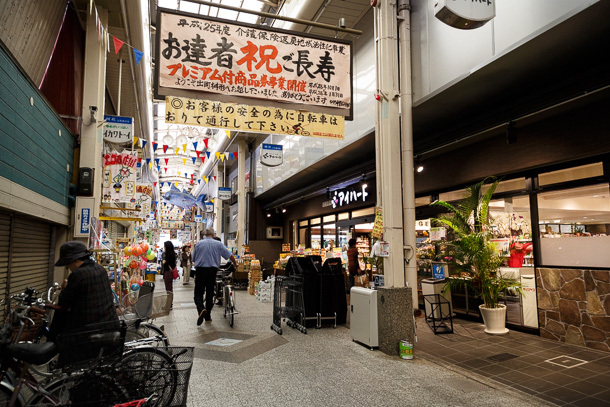 In his blog, he goes on to note how this kind of community life becomes more and more rare with time, as shōtengai are supplanted by shopping centers and supermarkets with parking lots. 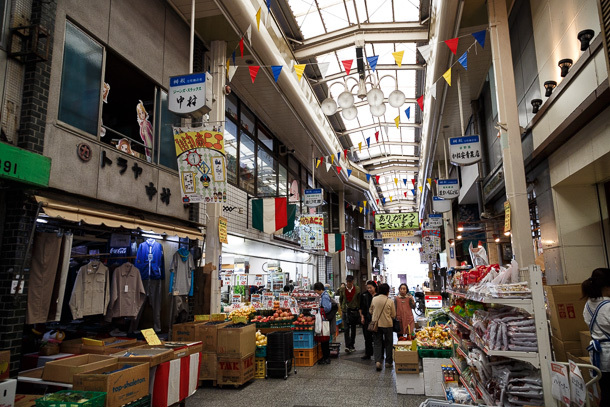 From my own observation, the pressures on shōtengai are not all that different from independent merchants around the developed world: competition from big box retail and online sales, difficulty finding successors to run the businesses, and well-intentioned but misguided urban policy which manifests as public and private redevelopment projects that too steeply discount the existing environment. The ruins of defunct shōtengai dot towns across Japan, and many are simply destroyed to make way for new development. 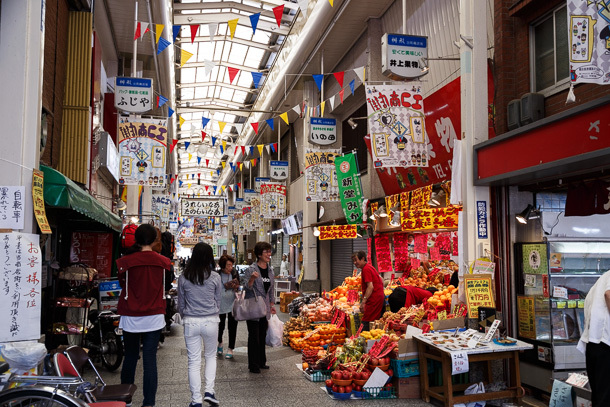 The man’s hometown has more or less lost any feeling of that original memory, but the vibrant atmosphere in Masugata Shōtengai brings it back in vivid recall. Above all, to be touched by such essence of human existence, is joyful. It might be the most heartfelt account of the emotions evoked by a street that I’ve ever encountered. 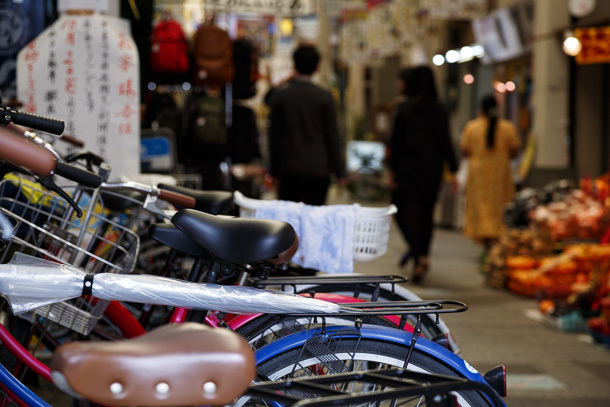 The sentiment is echoed by many others that have stumbled into the shōtengai for one reason or another, and is a testament to the valuable sense of community and place that Demachi Masugata Shōtengai nurtures. About a week after that encounter, Masugata would begin to host visitors of a somewhat different variety. A few had already trickled in. 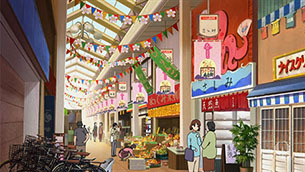 For its original animated series Tamako Market (たまこまーけっと), which aired its first episode on 2013 January 10, Kyoto Animation chose Masugata as the model for the setting the characters in the story inhabit, lovingly recreating the shopping arcade almost in its entirety for the show background artwork. 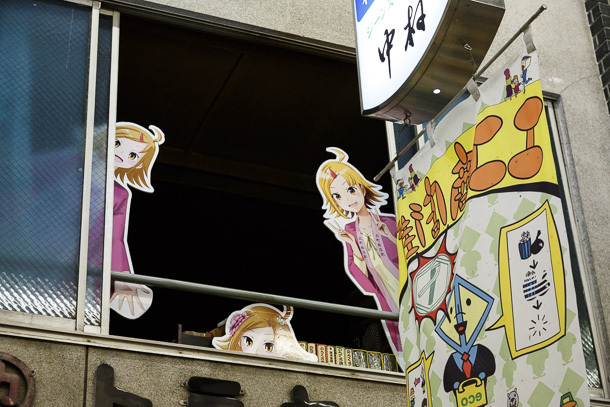 A variant of pop culture tourism based on manga and anime, known among its practitioners as either seichijunrei (聖地巡礼)—lit. holy land pilgrimage—or butaitanbou (舞台探訪)—stage exploring, would inundate the shōtengai with new visitors from near and far over the course of the 12 week season and for quite a while thereafter. 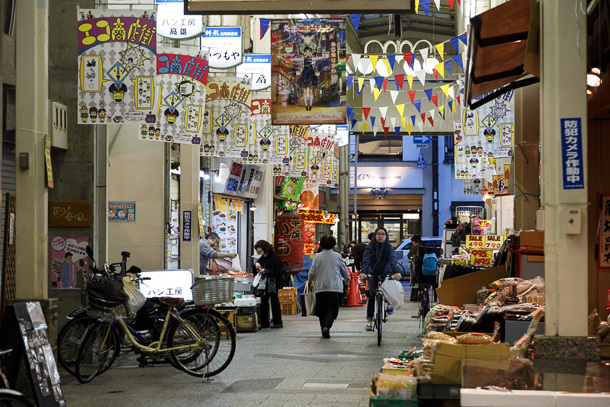 This post, more of a miniature research project than a quick read, uses Demachi Masugata Shōtengai and its connection to Tamako Market as a case study in an attempt to understand how people relate to public space and sense of place via the trail of information they create with digital media, including photos, videos, blogs and social networks. It begins similarly as most of my neighborhood exploration posts do, with some background about the location and a set of photographs and observational notes about things I found when I visited on 2013 October 16-17. 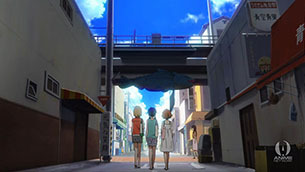 The one twist is that this section also includes some frames from the animation for comparison and notes about their significance in the story. 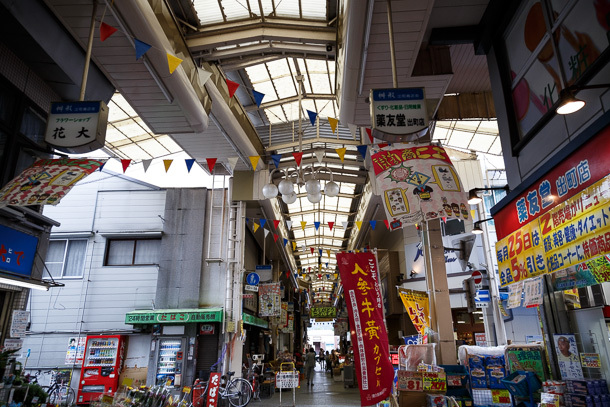 The post then goes on to explore the interactions between the shopping arcade and its extended community of stakeholders. It looks first at outgoing communications from Masugata, community organizations and notable individuals. 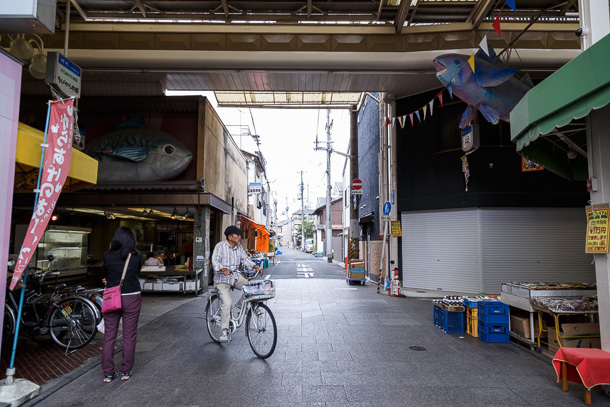 In the final section, we analyze the large associated body of what Dr. Christian Dimmer calls “otaku urbanism”—non-expert yet still very sophisticated observation of, commentary on and engagement with public space and urban design. 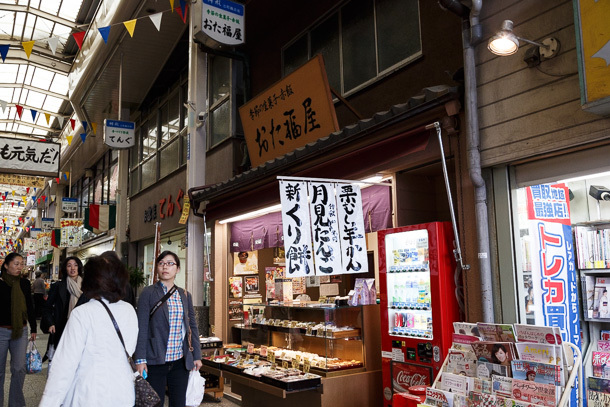 The first part covers “vanilla” consumer generated media, a broad cross-section of locals, tourists and residents from other parts of Kyoto surprised by their unexpected find. 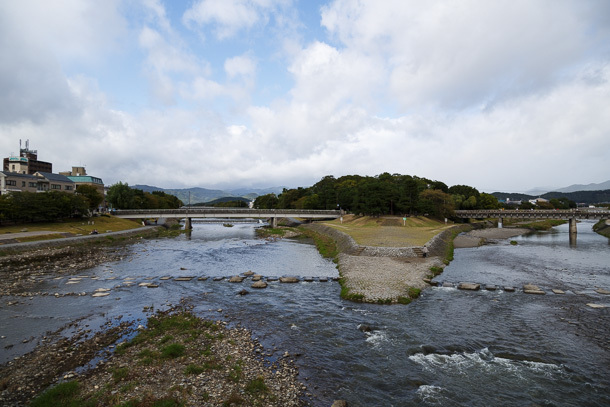 The final part specifically looks at the seichijunrei–butaitanbou community. 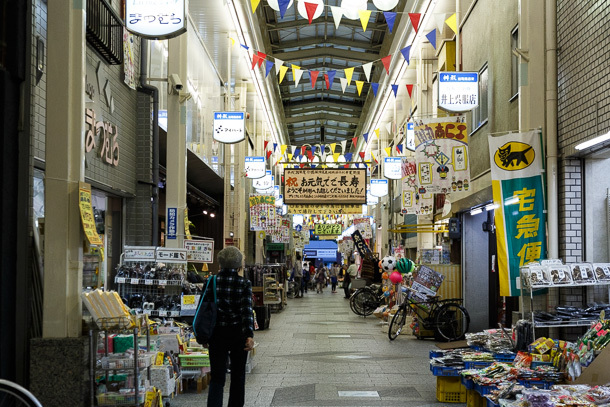 The east entrance to the arcade is just up the street from the intersection of Imadegawa-dōri and Kawaramachi-dōri, northeast of the Imperial Palace and a stone’s throw from the west bank of the Kamo River. 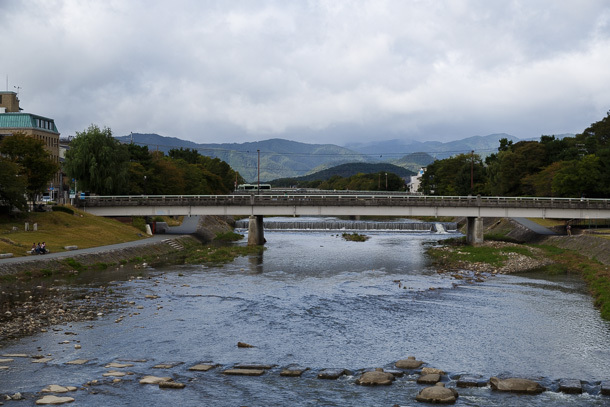 The Demachi Bridge takes you across the delta where the Kamo and Takano rivers meet, depositing you at Demachiyanagi Station on the other side. The rail station is the terminus for both the Eizan Electric Railway, with two lines that run north through Kyoto suburbs and into the foot of the mountains, and the Keihan Main Line, which runs south along the Kamo River, all the way through Kyoto before turning southwest and heading into Osaka. 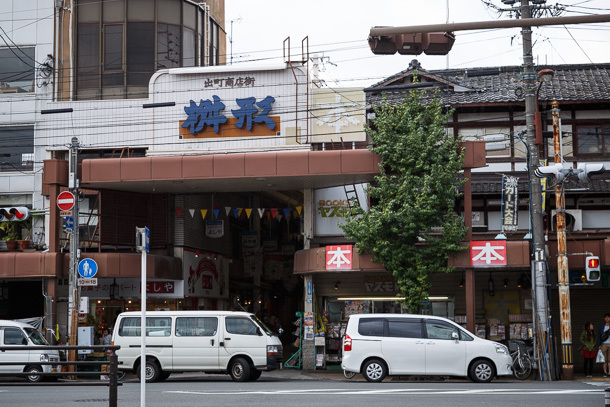 The area in front of Demachiyanagi Station is also a shōtengai, with shopfronts lining both sides of a small, traffic bearing street. Winding east-southeast will eventually bring you back to Imadegawa-dōri and directly into Kyoto Univeristy. 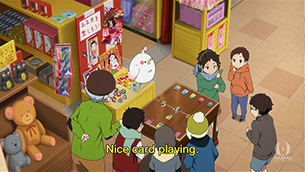 The map above is the one I created during the Tamako Market broadcast to keep track of locations as they appeared in the show. 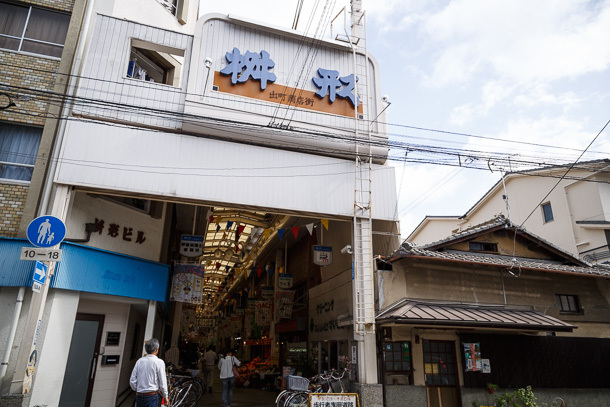 Though there is evidence of some food manufacturing and wholesale in Demachi as early as the Edo period, a grocery store established in 1924 is the first significant retail operation. 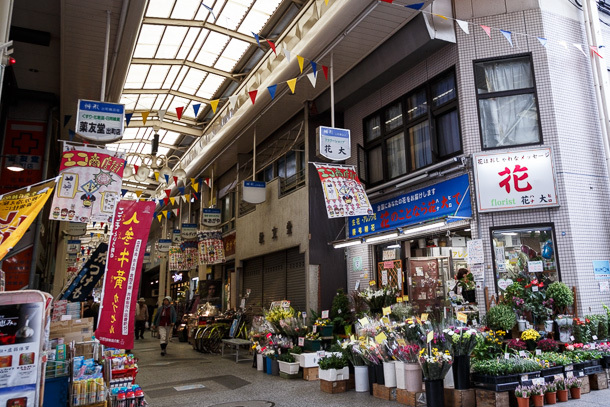 A business improvement organization was established after World War II, and by 1961 a commercial district in Masugata-dōri (桝形通), the current location of the market, was well underway. 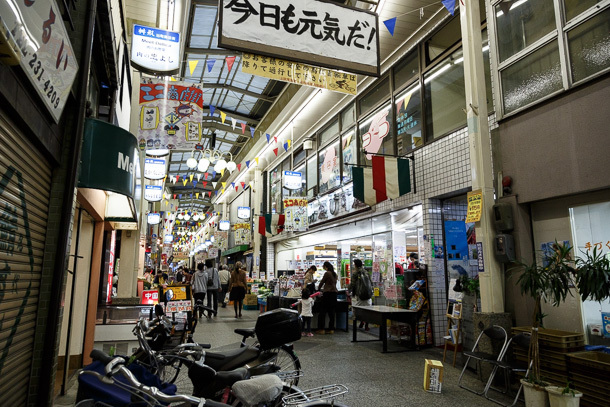 The covered arcade was built in 1974 and the Masugata business cooperative that currently manages the shopping district was established on 1977 April 25. The street was replaced with granite pavement in 1991 through a grant from the city. 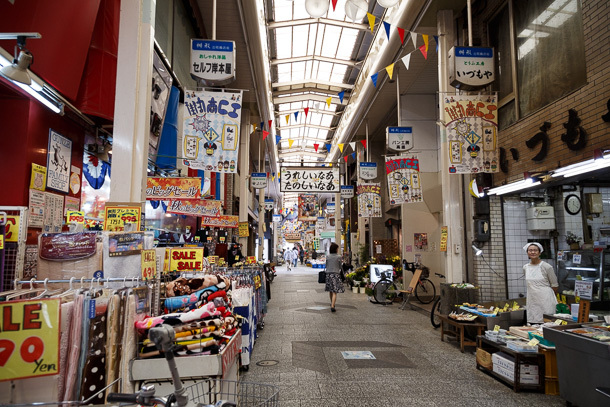 Many people actually call the arcade Demachi Shōtengai (出町商店街), however that term, when used on the official website, seems to refer to the general business district, extending beyond the arcade to other business-lined streets nearby. 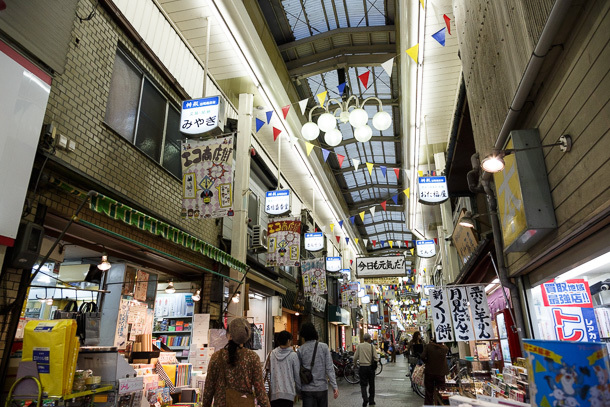 Masugata Shōtengai (桝形商店街) or Demachi Masugata Shōtengai (出町桝形商店街) specifically refer to the covered pedestrian arcade. 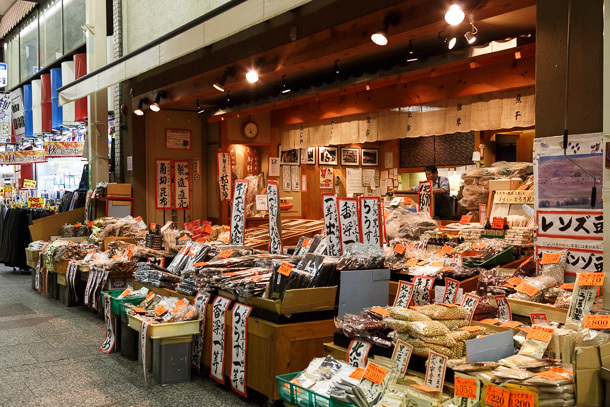 Besides hosting Shimogamo Jinja, one of the most significant historical cultural properties in Japan and an UNESCO World Heritage Site, Demachi is also the end point of the Mackerel Road (鯖街道 Saba kaidō). 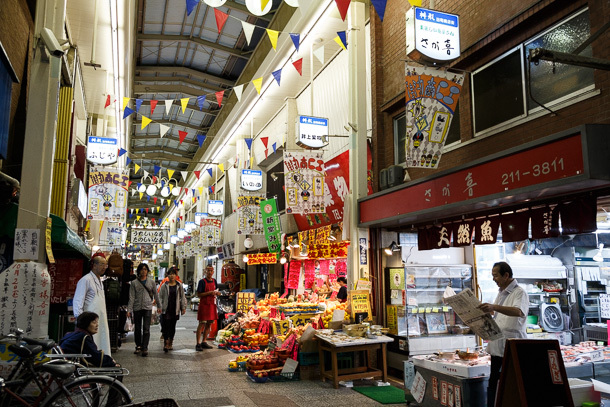 This was the route by which seafood, especially mackerel from Wakasa, now part of present day Fukui Prefecture, were transported to the ancient imperial capital in Kyoto. 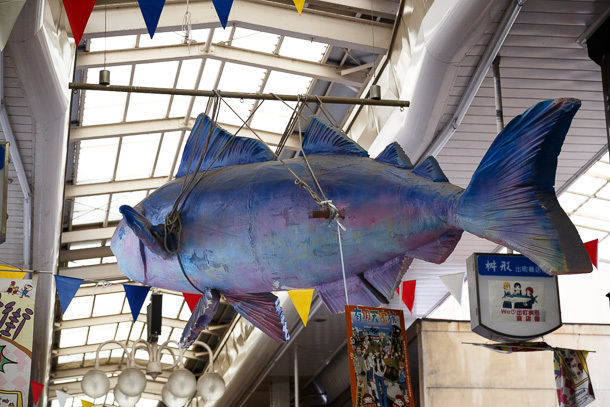 Demachi Masugata Shōtengai pays homage to this history with decorative tilework in the pavement that depicts the route and fish, and a large foam mackerel—officially dubbed Waka Saba-chan (若さばちゃん)—suspended from the ceiling that was added a few years ago. 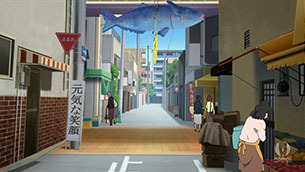 The mackerel was the primary clue that led to the seichijunrei-butaitanbou community’s early identification of the setting based on advance promotional visuals. Kamogawa Makoto (加茂川マコト) is a fictional mascot character that was under exclusive contract for use by Masugata for several years. 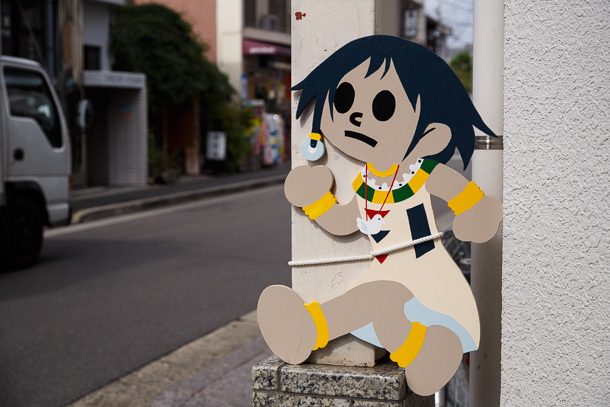 Makoto is part of the Kotomaki Project, a stable of moe (萌え) styled characters created for the express purpose of regional revitalization through promotional material intended to appeal to a young demographic. This approach is consistent with similar efforts by municipal authorities and business districts across Japan over the last decade or so, though my review of consumer generated media pertaining to the topic suggests some people aren’t very convinced of the fit of these kinds of characters with the sense of place they are attempting to promote. 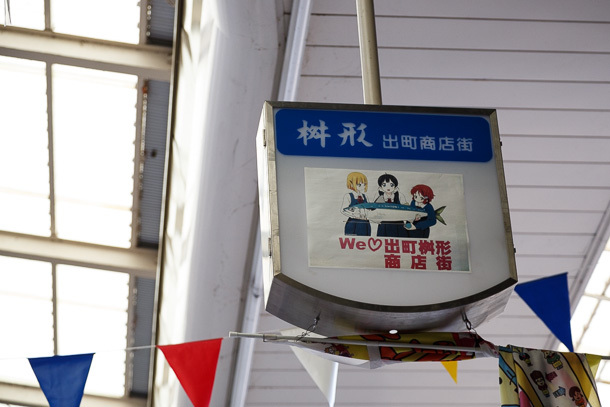 In a move that raised more than a few eyebrows, Masugata terminated the exclusive contract on 2013 February 1, just after the first few Tamako Market broadcasts. The timing inevitably led to a fair amount of conjecture, though I suspect only the respective managements know the details of the matter. Makoto paraphernalia could still be found in the shōtengai as of 2013 October. 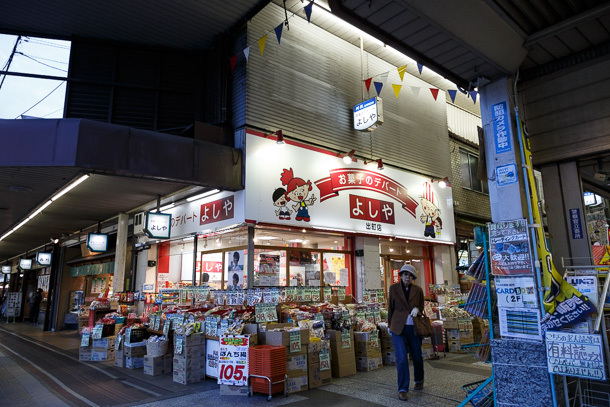 In the show, Demachi Masugata Shōtengai becomes Usagiyama Shōtengai (うさぎ山商店街), where protagonist Kitashirakawa Tamako has been essentially raised by the community of independent shop owners and patrons of the shopping arcade. 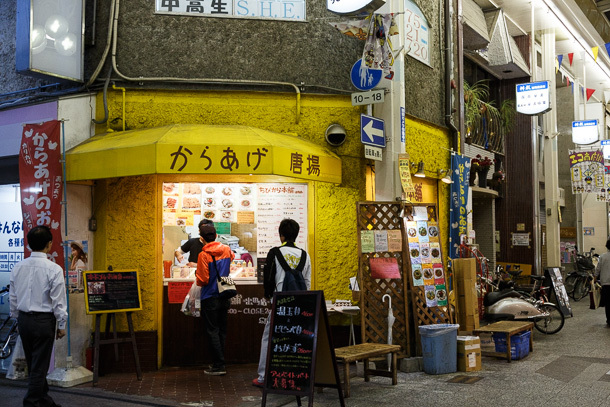 Her family runs one of two mochi making shops on one of the narrow streets that intersect the arcade. In his review of the show, Carl Kimlinger gives a fair assessment when he describes the show as fun, cute and enjoyable, and not much more. There’s no substantive conflict, either utilitarian or existential, as an anchor to the lighthearted humor and antics of the characters. The shōtengai is not being shut down. 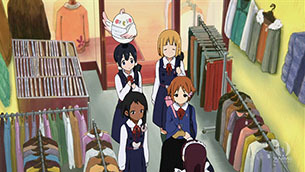 Tamako is oblivious to the romantic interest from two of her companions (an issue the upcoming film sequel Tamako Love Story attempts to rectify). The shop staff are mostly a little crazy, though always lovable. 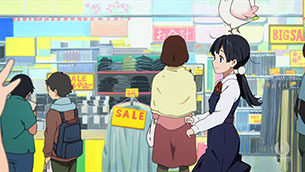 For a western audience accustomed to strong character driven narrative, Tamako Market doesn’t appear to offer much in which to invest. However, what I think these criticisms miss, is that the comparatively shallow depth of individual characters opens the door for the shōtengai and community to fill more of the screentime. 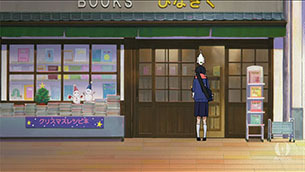 The arcade itself becomes a character, and Tamako is its mascot (perhaps to the chagrin of Kamogawa Makoto). 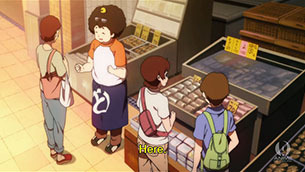 The English label “slice-of-life” gets thrown liberally at any Japanese animation that depicts routine behaviors, though most of the time “sit-com” is probably a more accurate description. 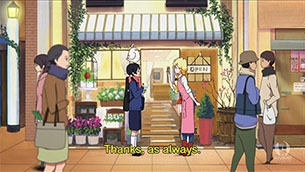 Tamako Market is a stream of vignettes illustrating the daily litany of interactions between denizens of the shopping arcade, loosely strung together with the thinnest of plots, and more closely hews to the original slice-of-life definition. If you have the time and interest to absorb a complete assessment of the 12 episode series, I have detailed analysis of each installment as part of my Weekly Review of Transit, Place and Culture in Anime. 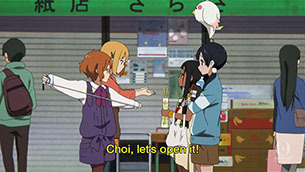 I’ve added the tag Tamako Market to the relevant weeks for quick access to an index. The show is always the first section at the top of the review. There are a few additional posts that have reports on pilgrimage activity that occurred after the broadcast. I saw your smile in passing and want to hug you tightly! P.A. 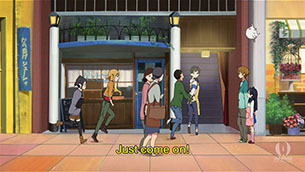 Works’ Uchōten Kazoku (有頂天家族)—titled in English as The Eccentric Family—is an anime series adapted from a light novel, which aired following Tamako Market in Summer 2013. 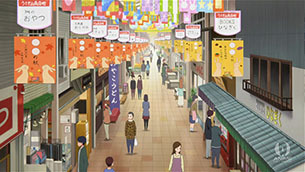 The animated version is like a love letter to the city of Kyoto, featuring landmarks and commercial and residential neighborhoods from nearly every part of town. Because the main characters live in nearby Tadasu no Mori, there are periodic scenes that depict Demachi Masugata Shōtengai. 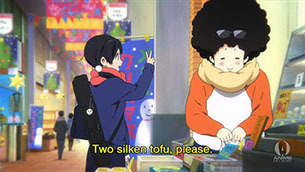 For the sake of clarity, the focus of this analysis will remain on Tamako Market. It’s enough to be aware of Uchōten Kazoku, as it comes up in some of the consumer generated media. @ye_bi_su has the definitive series of Uchōten Kazoku seichijunrei. The east entrance to the arcade is the conventional “front”, with a larger awning that opens onto an arterial road, though what one considers the primary access point may depend more on point of view. For residents in the neighborhood on the west side, it’s more likely the “back” door that they consider as the primary interface. 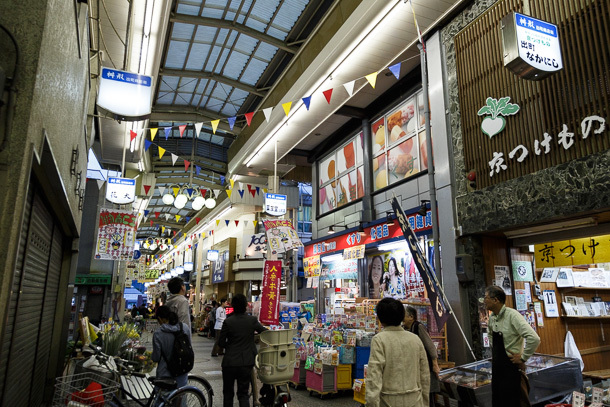 In Tamako Market it’s clearly the latter orientation, as the Kawaramachi-dōri entrance never appears even once. This first and larger section of photos was taken in the late morning on a weekday, during light activity. A second set taken at night has a different vibe. 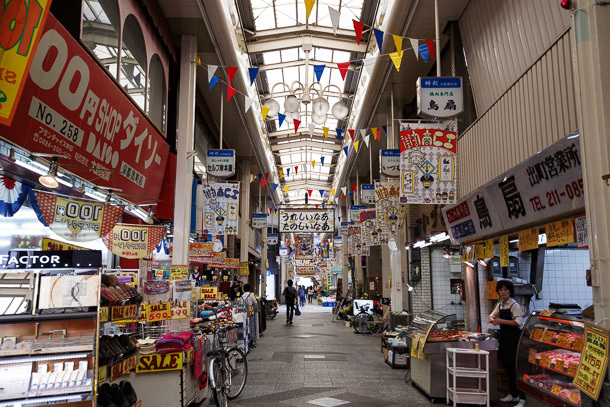 Covered sidewalks flank either side of the entrance, though are considered separate from the arcade itself. 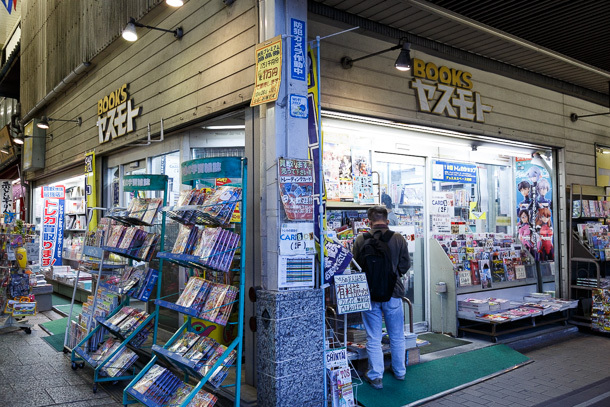 The anchor tenants Yoshiya (よしや) and Yasumoto Books (Books ヤスモト) make the most of their location, lining up merchandise around both sides of the corners. Turnover is a fact-of-life for business districts everywhere. 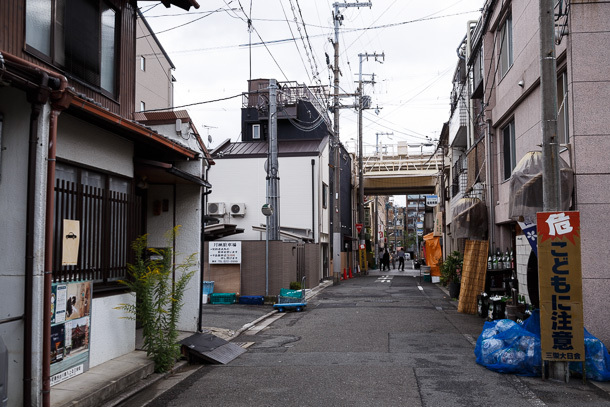 This photo was taken in 2013 October, but by the end of that year Yasumoto on the right had vacated the space. 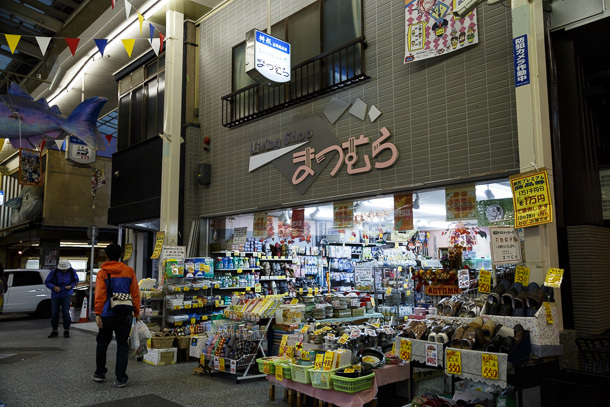 Confectioner Demachi Futaba (出町ふたば) is not inside the arcade, but is significant for two reasons. 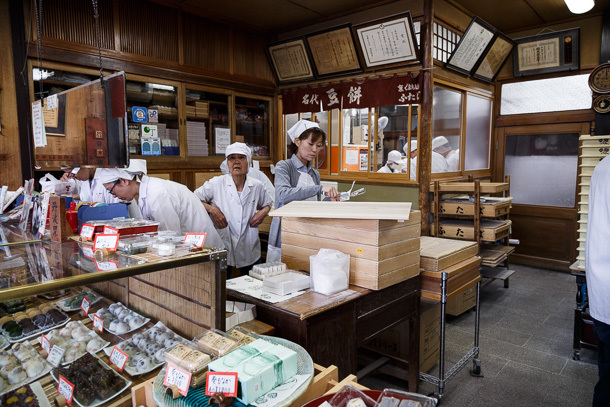 Founded in 1899, it is widely considered to be one of the best makers of wagashi (traditional Japanese sweets) in Kyoto, and is well known throughout Japan. Everything is made on site just behind the counter, and there is almost always a line. 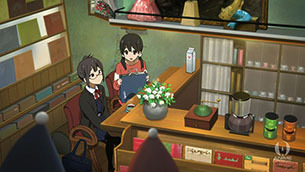 It is also the source of the story element in which Tamako and childhood friend Mochizō are the children of competing mochi makers. 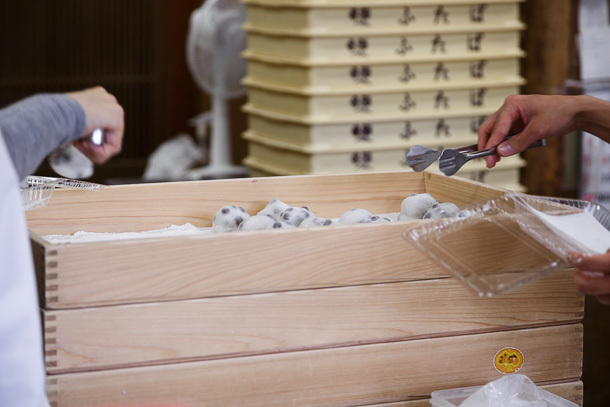 The mame-mochi is Demachi Futaba’s signature item. The mame are the whole red beans kneaded into the glutinous rice dough wrapper. 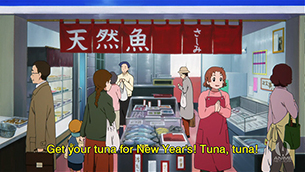 It is ported directly into Tamako Market where it becomes Tama-ya’s specialty, shown being eaten in Episode 1 and manufactured in Episode 2. If you concatenate the given names of Tamako’s father (Mamedai) and grandfather (Fuku) you get mame-daifuku, another name for mame-mochi. 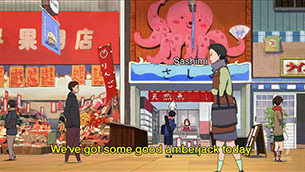 Tamako’s sister Anko is named for the red bean past filling, and Mochizō—you can probably figure that one out. 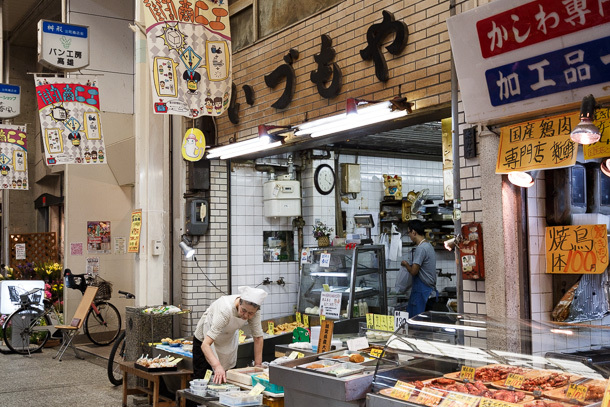 Otafuku-ya (おた福屋) is a confectioner just inside the arcade east end. 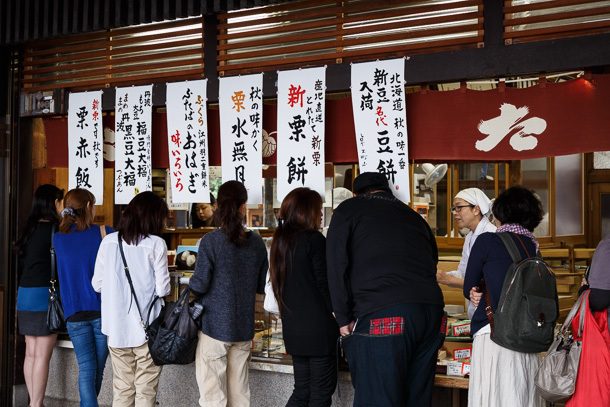 Tengu (てんぐ) is one of several shops that specialize in osōzai (お惣菜)—obanzai (おばんざい) in Kyoto dialect—very high quality, hand-made takeout food. Looking up, you can see the first of several hand-painted banners suspended from the arcade roof. 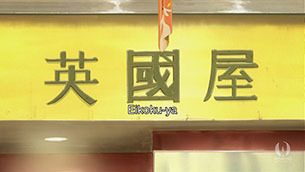 Some have large, bold kanji, others contain multicolored pictures. The one at the front with 今日も元気だ！(It’s a great day!) is recognizable as a Masugata icon and shows up often in photographs taken here. Ebisu-ya (ゑびす屋) on the right is one of several grocers. Storefront displays chew on the street. Attractively arranged product is its own best advertising. 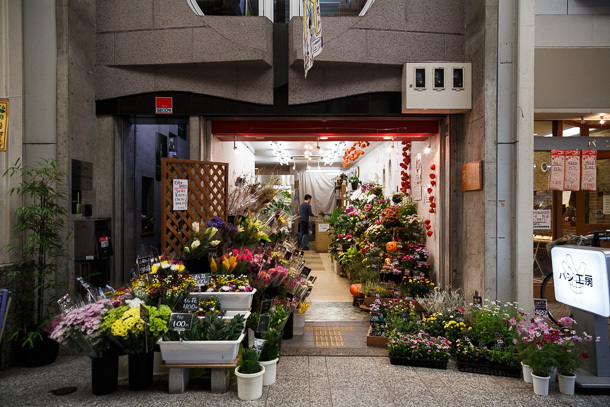 Hanahiro (花大) takes advantage of its interior corner location to pile its flowers high and wide. 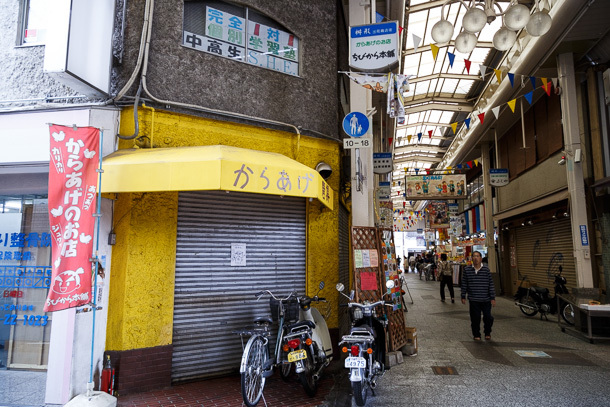 I’m curious about the story behind the sign above the shop on the left, which is actually called Berudia (ベルディア). 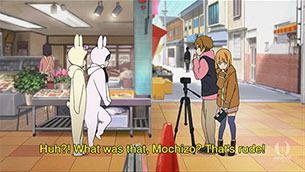 In Tamako Market, this is the scene of a failed attempt to find age appropriate street clothes for Choi. 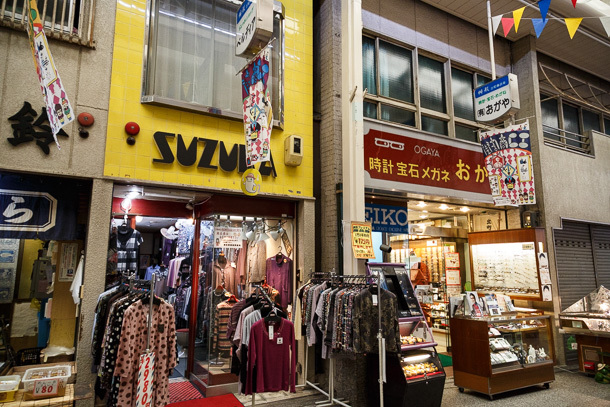 On the right is Ogaya (おがや), which sells watches, glasses and jewelry. 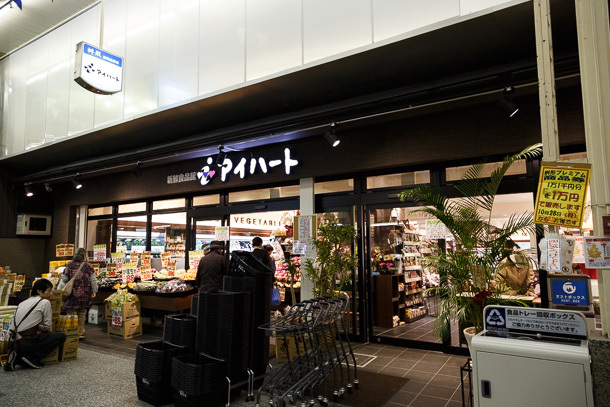 Aihato (アイハート) is another grocer, and I believe a relative newcomer to Masugata. We stopped in here at least once a day to pick up snacks for the road or late night deals on the way back. For the time in Kyoto, I reserved a room at a family run ryokan a block away from the shōtengai so that I would be able to pass through each day en route to other parts of the city. Have I mentioned that I’m a complete nerd? Masugata Shōtengai has three parts separated by narrow intersecting streets. 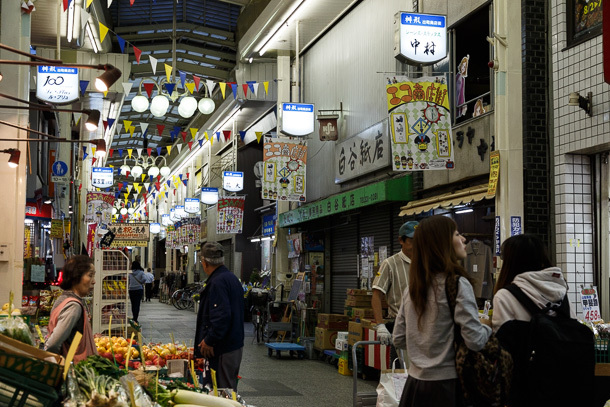 The west end of the middle segment and all of the west segment are most heavily incorporated into Tamako Market, so this is where you begin to get a strong sense of déjà vu. 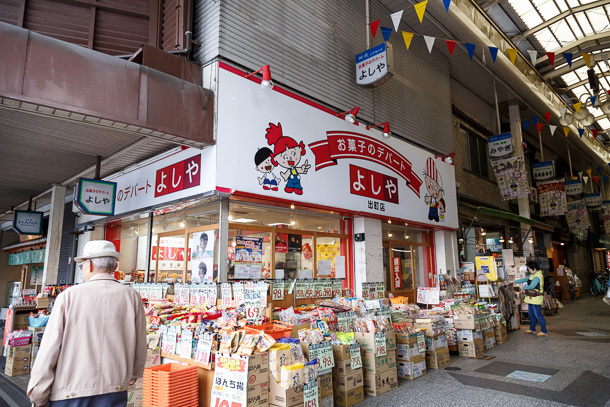 Ikawa Toy (イカワトーイ) becomes Tokiwa-dō (トキワ堂), the toy shop run by Midori’s grandfather. 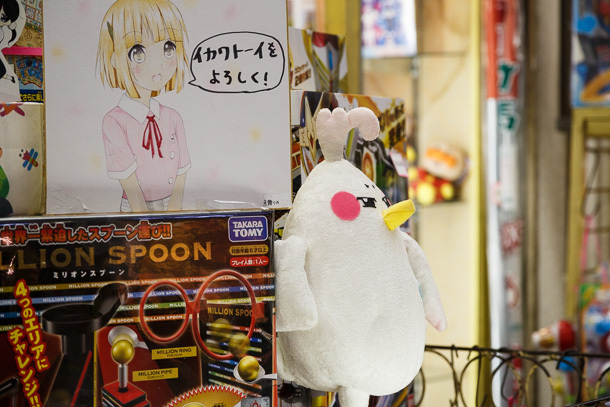 As fans of Tamako Market make their pilgrimages to the hallowed ground of the shopping arcade, some leave gifts of hand-made artwork and handcrafts based on the animation. Ikawa Toy has a watercolor of Midori and plush doll of Dera on its front display case. Living Shop Matsumura (リビングショップ まつむら) is a zakka shop, a random assortment of odds and ends that seem more and more necessary to daily life the longer you stare at them. I love these places, though it’s best if I hand over my wallet to a friend beforehand. 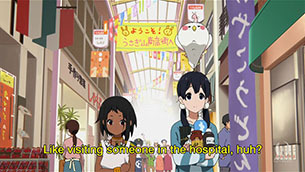 The characters don’t interact with its Tamako Market counterpart Living Shop “Usual” (リビングショップ いつもの), but it’s often there in the background. Here is the large mackerel. One interesting difference is that the model is actually inside the west end of the middle segment, not in the intersection as depicted in Tamako Market. It is only visible while inside the shōtengai, not from the side street. 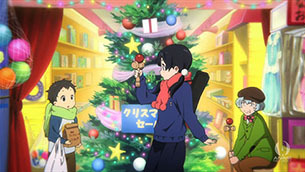 There are a bunch of these drawings of Midori, Tamako and Kanna admiring a mackerel, though it’s not clear if these were donated by pilgrims or made by shop staff. The weekend before this post was published, a group of people decided it would be fun to spring Waka Saba-chan loose for a day of fun alongside the Kamo River, enjoying one of the final days of cherry blossom viewing. I kept tabs on the jailbreak and return in a separate post. Seems that a good time was had by all. Chibikara (ちびから) is a karaage stand. 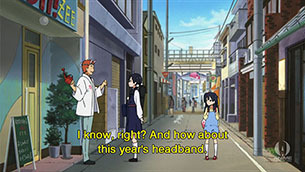 The characters in Tamako Market don’t interact with it, but this is the intersection closest to Tamako’s home, so it appears often in the background. Chibikara generally opens in the afternoon. 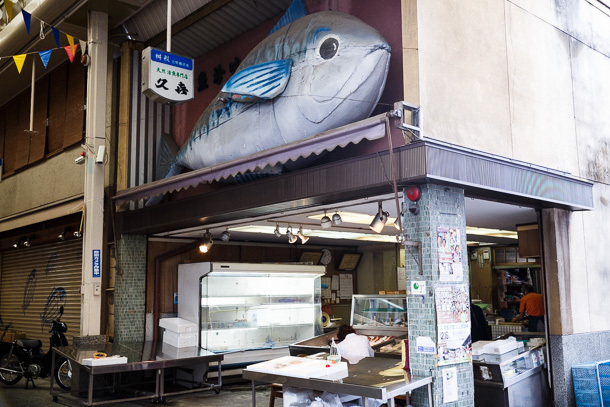 This fishmonger with the large mackerel above its awning also appears frequently in the Tamako Market background. —if they were actually there. 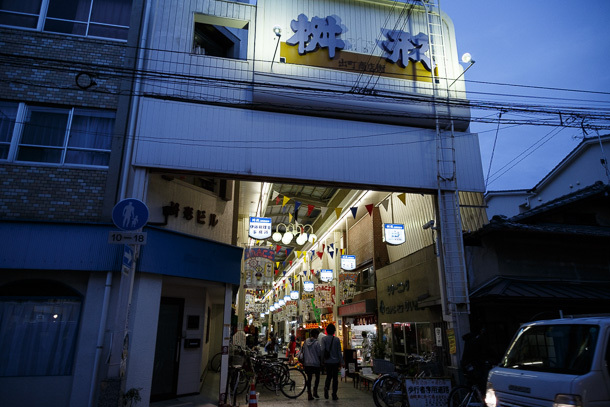 The location of the Tama-ya shophouse is actually a small grocer in a modern concrete building. 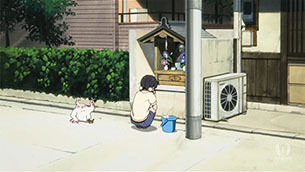 In Tamako Market, Tamako tends to a miniature shrine with a small statue of Jizō, a bodhisattva that, in its Japanese version, is regarded as the guardian deity of children, especially those who have died before their parents. 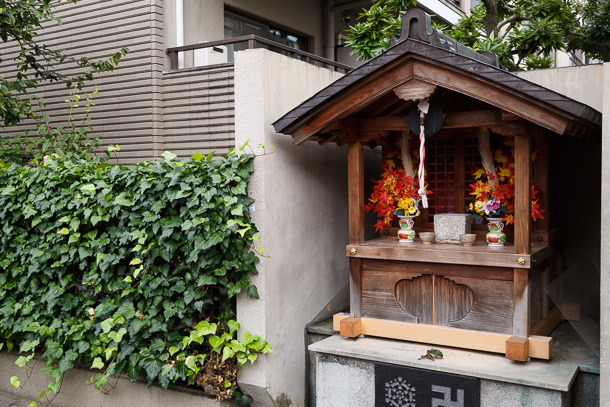 The actual shrine is even simpler and does not contain any statue. 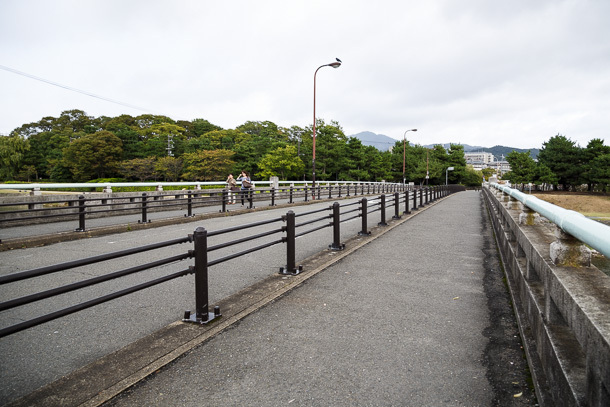 The driveway on the left is the approximate position where Ōji-ya/Ricecake Oh!Zee would have been. 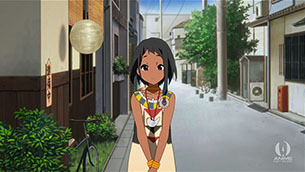 The florist Hana no Harukaze (花の春風) was given a substantial makeover in its transformation to Florist Princess (フローリスト プリンセス). 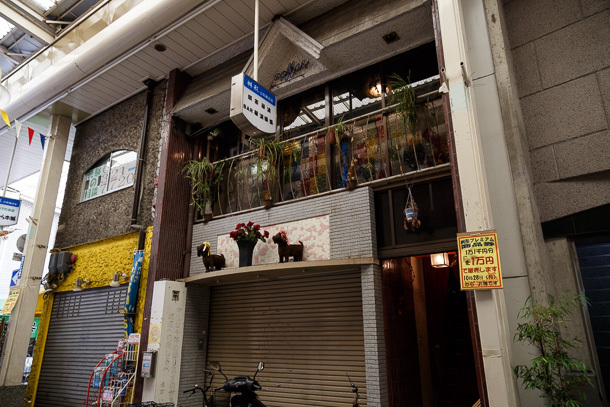 The second floor cafe and bar Hananami (華波) has perhaps the most significant role in both Masugata Shōtengai and Usagiyama Shōtengai. 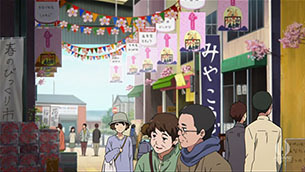 In Tamako Market, Hoshi to Piero (星とピエロ Stars and Clowns) is a frequent meeting place for many of the characters, a neutral third place to congregate outside of school/workplace and home. 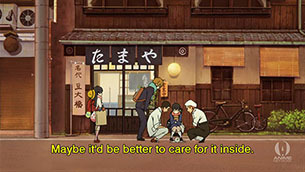 Tamako and other children of the shōtengai—some of the adults, as well—come here to sip coffee from quirky porcelain cups and receive cryptic pearls of wisdom from Kunio, the cafemeister. 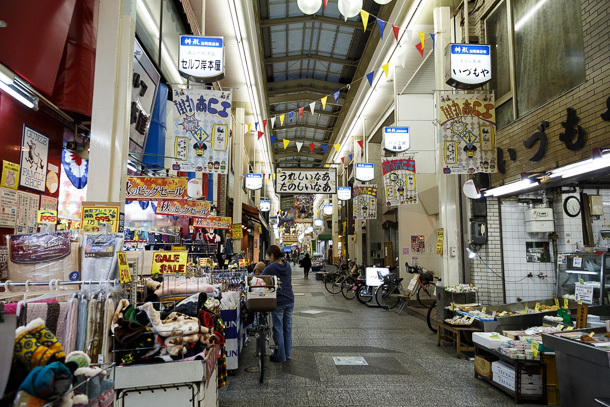 In real life, this is also one of the best meeting places in Masugata, with a fun overhead view of the arcade. It became the unofficial sponsor of debriefing meetings held by the core seichijunrei-butaitanbou community after a long day of pilgrimage. 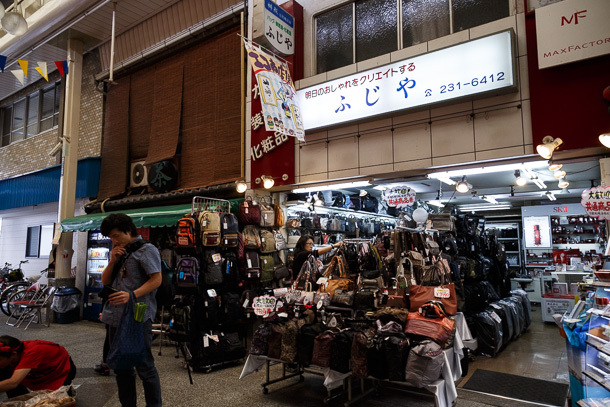 Self-Kishimoto-ya and Daiso (セルフ岸本屋・ダイソー) are a combination clothing and 100 yen shop. 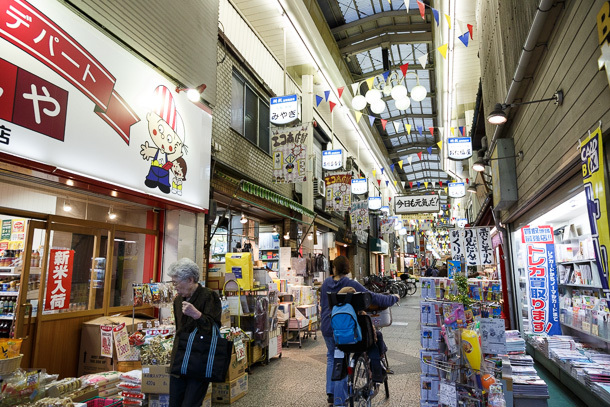 Kishimoto-ya opened in 1961, and is probably one of the oldest continuously operating businesses in the arcade. 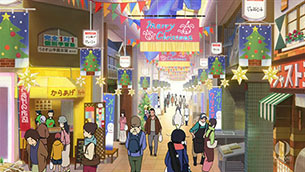 While the shop appears in the Tamako Market opening credits and is depicted with some shopper activity in passing, the main characters do not interact with it. Izumo-ya (いづもや) is a tofu specialist. 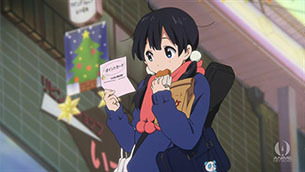 In the show, Tamako often stops by Shimizu-ya (清水屋) to pick up tofu for meals on her way home from school. 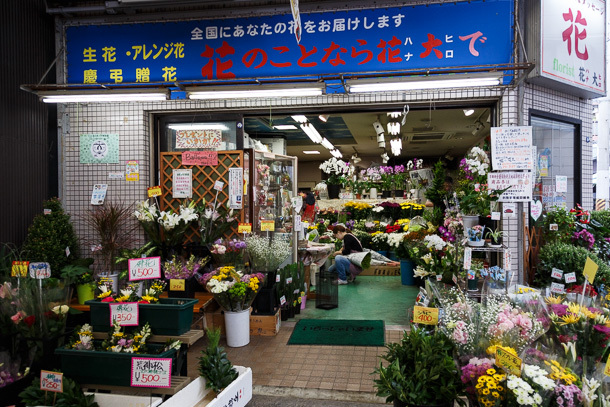 Inoue Fruit Shop (井上果物店) is exactly as its name suggests, and stocks some vegetables as well. 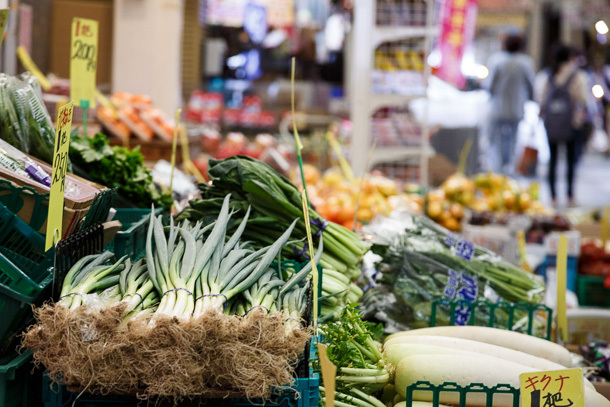 The large display frequently attracts a crowd, even people not intending to buy any produce. 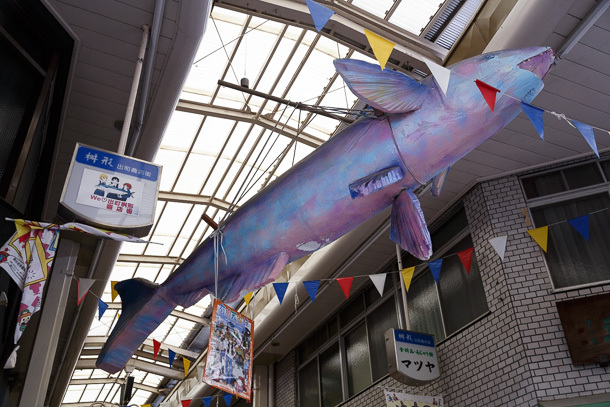 Sagaki (さが喜) carries on the tradition of seafood trade at the end of the Mackerel Road, however it’s also significant for a number of other reasons. 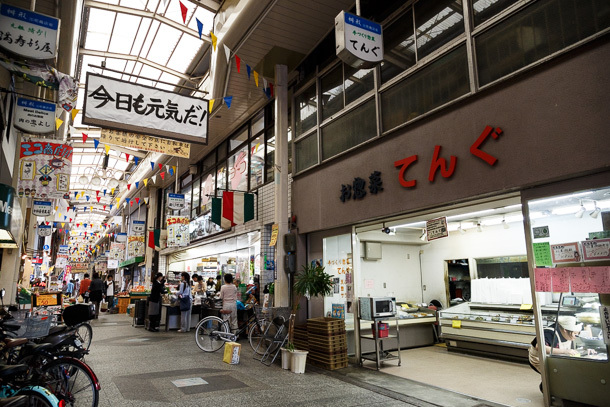 Its proprietor, Inoue Atsushi (井上 淳), is also the current president of the Masugata business cooperative, so the business and community environment at the shōtengai is a very high priority for him. 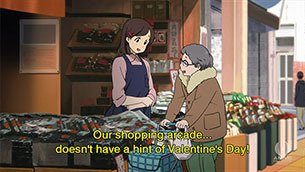 Inoue became the unofficial receptionist for Tamako Market visitors, providing a space to store the exchanges notes, a notebook (or a set of books) pilgrims often leave at the site of a “holy land”, and often staying late at night in the arcade, long after the rest of the shops have closed, with hot tea ready to greet those that traveled into Kyoto on evening trains and came to Masugata for a late visit. There is more information about Inoue in the section on Highly Visible Individuals. 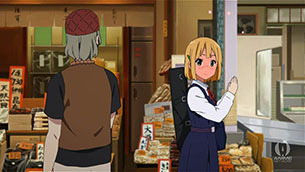 In Tamako Market, Sagaki becomes Sashimi (さしみ) and is a frequent scene of activity, where Tamako often stops to talk with the husband and wife that run the shop. Choi! This particular fan art contribution follows a trend of characters cut from wood, hand painted and donated to a site of significance. The funny part is, I’ve been Twitter friends with @tesra1141 for quite some time, but only very recently realized he made this one! He made a recent visit to give Choi’s paint a touch-up. This would have been the last of the daytime photo set, but there was one more person we needed to see before we left. 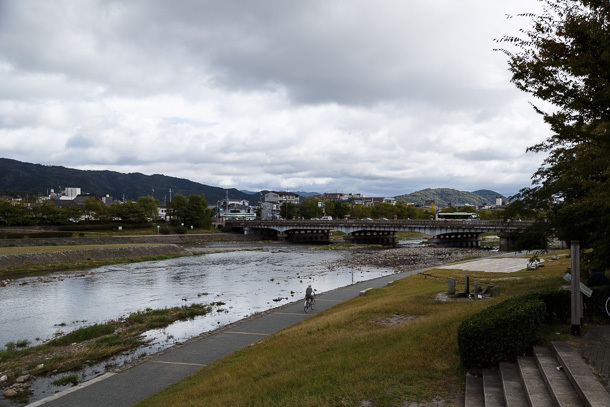 This is the nearby Demachi Bridge and Kamo River delta. 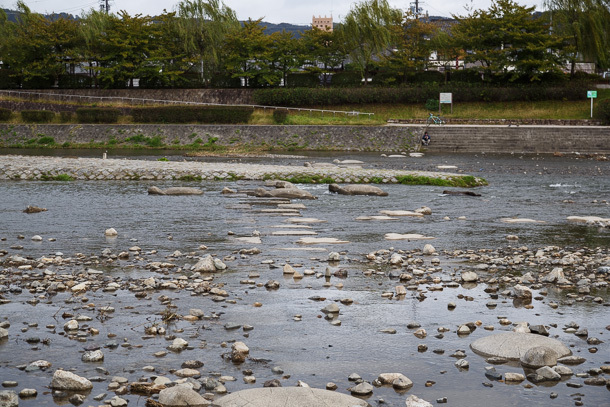 The turtle-shaped stepping stones are a Kyoto landmark and have appeared in multiple animated works, including in the opening credits for Kyoto Animation’s K-On! Prior to my visit, Kansai had been upturned by a very severe typhoon, which deposited large amounts of rocks and sediment in the delta and other parts of the river. It has since been restored mostly to its former state. There are two significant differences to note about nighttime at the shōtengai (this particular set of photos was taken on a Thursday). One is that the crowds are generally denser, comprised of shoppers on the way home from work in the early evening and strollers out for leisure, dessert or drinks later on. The second is the ambient light and sound. 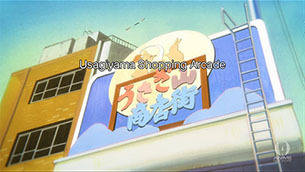 I didn’t realize until I looked through all of the screen captures that Usagiyama Shōtengai really only had two settings: daytime and after closing. 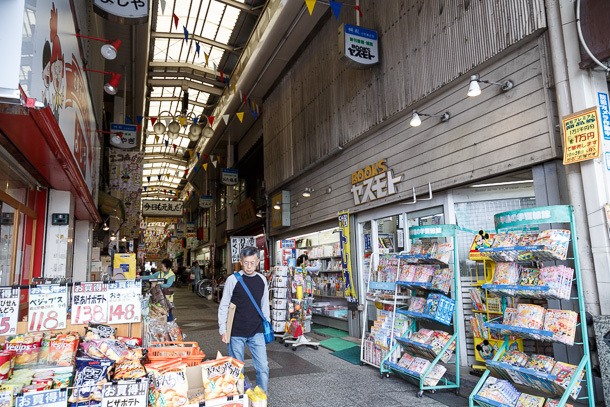 In Tamako Market, we never see the arcade lit up at night, just closed shutters and dim light from the backlit shop signs and a few safety lamps. At night, Masugata Shōtengai has a warm, green glow, which photographers will recognize as the color cast that results from older types of fluorescent lighting. Normally, during post-processing a photographer would remove the cast so that whites look more or less white, as our eyes would do in real-time. However, many of the facades have a moss-green stain or tilework and there are quite a few green awnings and tinted windows, all of which change the color of the reflected light, so many of the whites actually do look green to your eyes. I tried to leave in as much of the color cast as I could without throwing off the rest of the colors. Along with the warm light, there is the din of shuffling feet and low to medium voices. I think this is a big part of the sense of nostalgia often experienced by first-time visitors. Stepping into the arcade, the pace and pressure of the outside world is attenuated, while the plasma that permeates the space bathes those present in comfort. 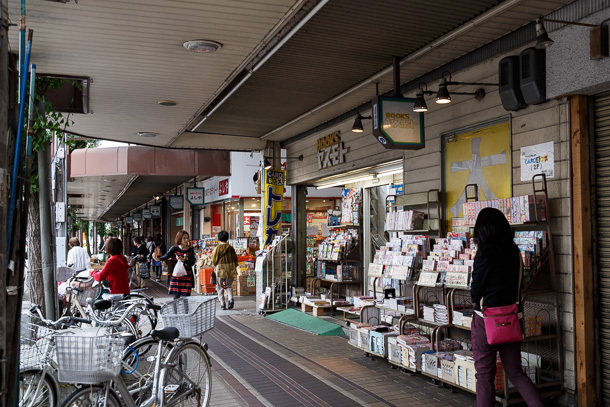 The green awning on the left belongs to stationary shop Miyagi (みやぎ). Oh, hey, I found Makoto-chan! This shot is not quite the peak weeknight crowd volume, though fairly busy. 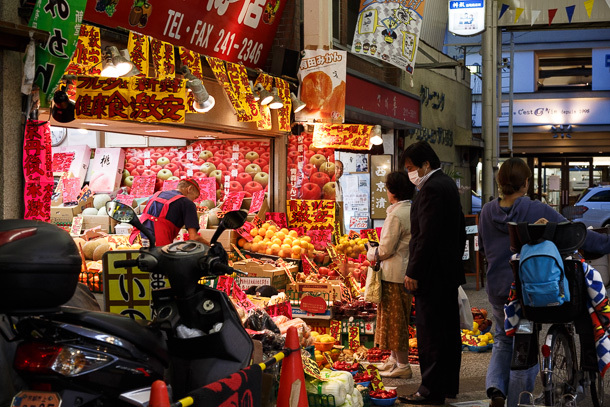 On the right is Demachi Nakanishi (出町なかにし), which specializes in pickled foodstuffs. 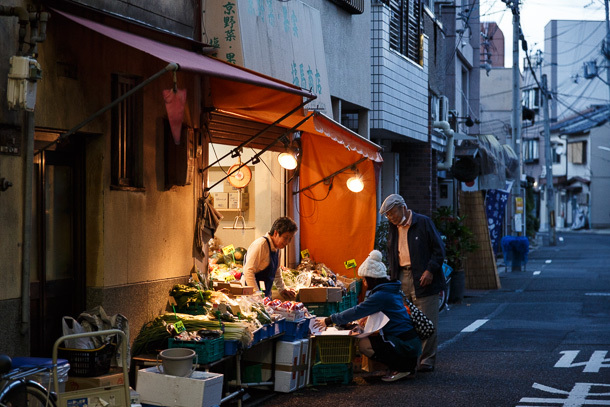 Evenings see a brisk trade in karaage. 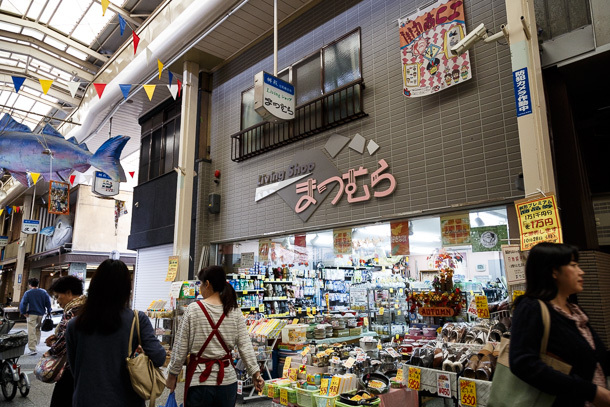 Fujiya Katsuobushi-ten (ふじや鰹節店) sells the indispensable base element for almost all Japanese cooking, katsuobushi—dried, fermented and smoked skipjack tuna—as well as other dried foodstuffs. 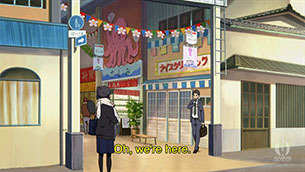 In Tamako Market, it appears in the background but the main characters generally do not interact with it. 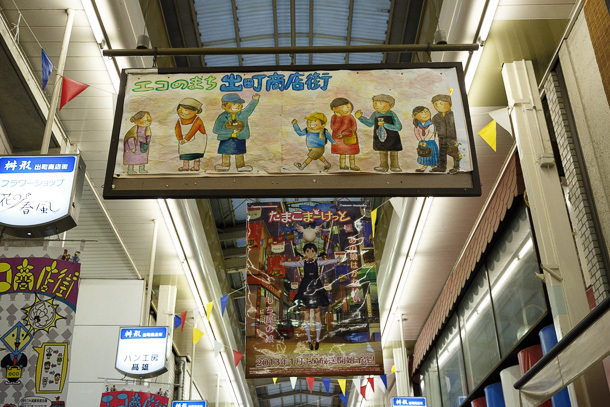 A hand-painted banner promotes the Demachi “Eco District”. 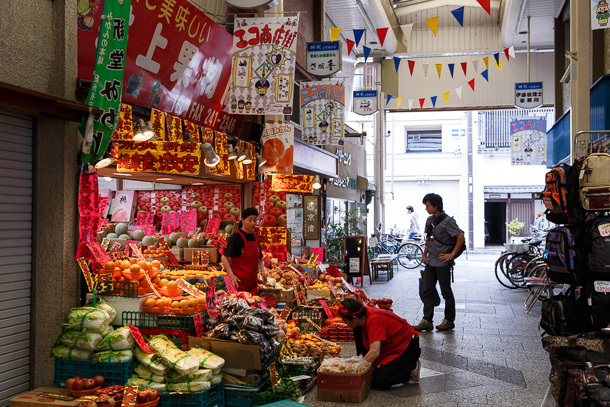 The shōtengai promotes the use of reusable bags and minimal packaging, and there is some documentation of a composting program for food waste. That’s Inoue Atsushi on the left, in the white coat. Stop by Sagaki in the evening for cup of tea and a chat. Bring a newspaper. No one minds, this is the community’s space. 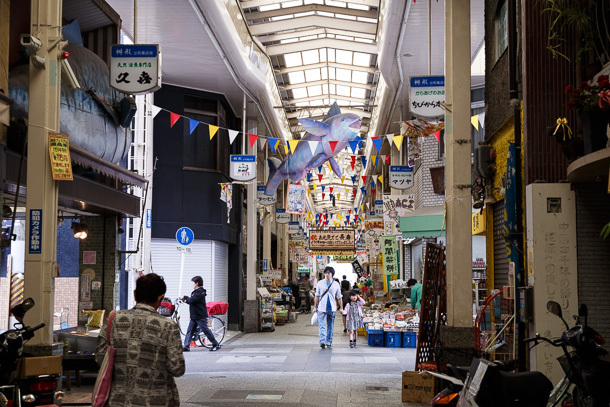 This section takes a very brief look at community groups and public events in Demachi Masugata Shōtengai. My hunch is that there are organizations active in the community that either don’t have a web presence or aren’t being picked up in my search queries. That said, I wanted to at least map out what I did find. The cooperative that manages the arcade does a good amount of outreach on its own behalf. It hosts fields trips for elementary school students and provides internship opportunities in sales for older ones. It plays coordinating roles in the annual Tanabata and Spirit Festival celebrations (more on both below). On its website, there is an archive of photography from events held in the shōtengai, as well as videos uploaded to its YouTube account. Masugata’s Twitter account was very active prior to and during the Tamako Market broadcast, participating in discussion threads about the show and even assisting the seichijunrei-butaitanbou followers with location identification. It subsequently went into a dormant period, but appears to have returned to life in the past month or so. This is the Demachi community development organization, which includes Masugata Shōtengai and the greater community around it. This is the owner of the “Eco Business District” initiative. The group’s Facebook page frequently posts news and photos from the arcade. This is a group that manages an indoor event space in a first floor garage on one of the side streets intersecting the arcade. The group’s Facebook page has some very extensive photography covering events in the space as well as the community in general. 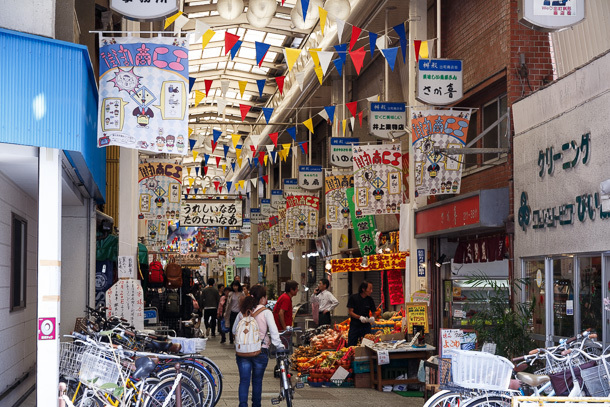 Organizes frequent events in the shōtengai, particularly regional product exhibitions and temporary art galleries. This page appears to be the 10th anniversary event of a group called “Getting Familiar with Demachi” (Demachi ni Najimu), which I think promotes local culture and attractions to the broader Kyoto community. Appears to be a limited time engagement effort that took place at the end of 2013. Tanabata (七夕) is celebrated all across Japan, and is one of the two major annual events at the shōtengai. 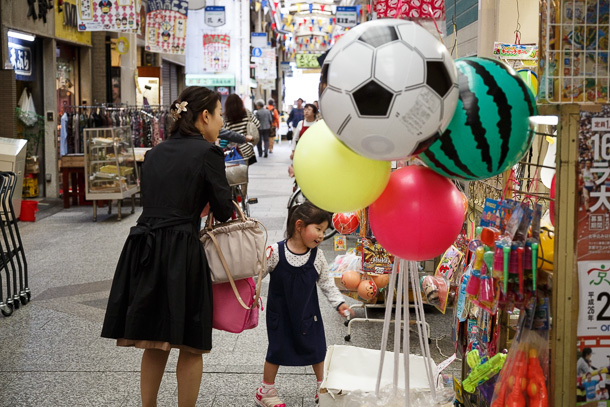 The Kyoto University Soccer Club assists Masugata with preparation for the festival each year, which include lining the entire arcade with elaborate paper streamers and bamboo branches. 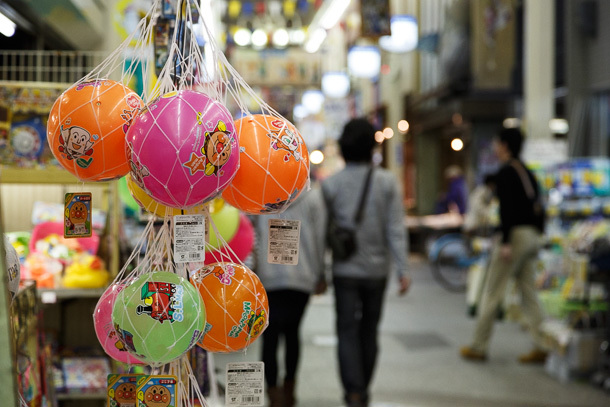 The Engagement sections of this post contain a large amount of media from the Tanabata events. Spirit Festival (御霊祭) is unique to Demachi. This large event is currently held each year on May 18 and is said to be the oldest known festival in Kyoto. A large parade that includes very ornate carts and portable shrines (神輿 mikoshi) that make their way around the entire district before arriving at Kamigoryō Jinja (上御霊神社) for an elaborate ceremony. One of the most high energy segments of the day long event is when the parade, including all of the carts and mikoshi, charges right through Demachi Masugata Shōtengai, with crowds of onlookers filling every available space in the arcade and up the side streets. 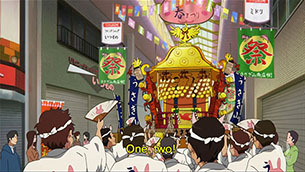 In Tamako Market Episode 4, this event is recreated in great detail, even down to quite faithful renderings of the costumes and mikoshi. 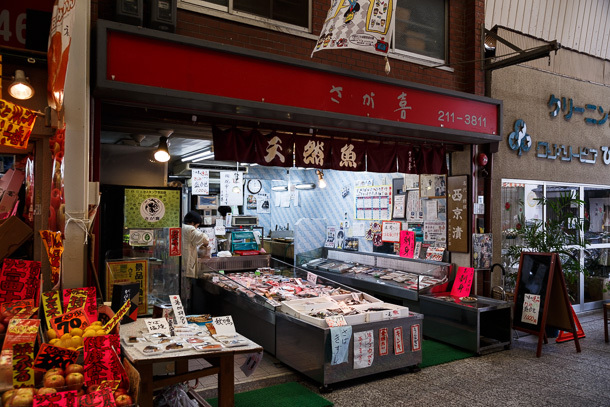 As noted in the Photowalk section, Inoue is the proprietor of fish seller Sagaki (さが喜) and current president of the Masugata Business Cooperative. 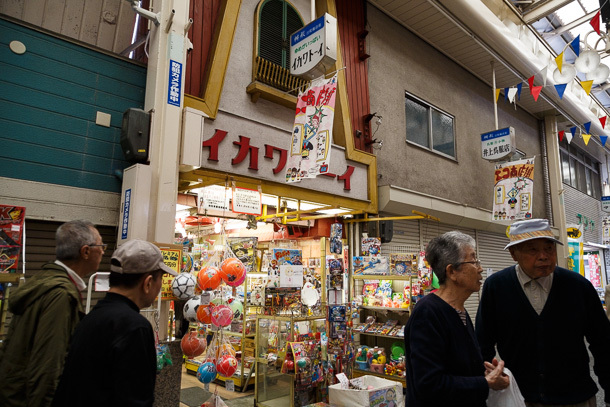 He is the public face of the Masugata Shōtengai, frequently quoted in media stories about the arcade and well known among the seichijunrei-butaitanbou community for his warmhearted reception of visitors. Make sure to say hello as you walk past. Moriwaki is the Senior Curator of the Kyoto Film Archive at The Museum of Kyoto. While his areas of highest focus include historic and culturally significant Japanese film, as well as workshops for aspiring filmmakers, Moriwaki also carves out space for meaningful animated works, particularly those by the home team, Kyoto Animation. 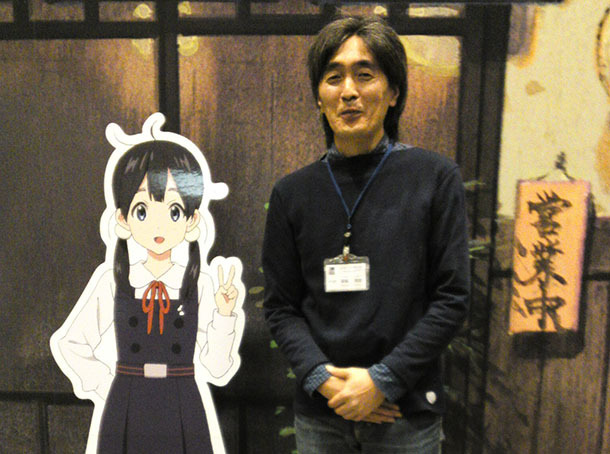 He was highly engaged with the seichijunrei-butaitanbou community during the Tamako Market broadcast and is a coordinator for the screening of the entire season in the museum theater on 2014 April 19. 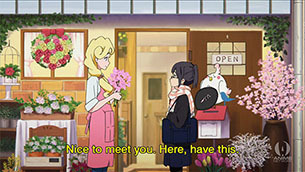 This screening will be followed by a Q&A session with staff from Kyoto Animation, and is part of the promotional campaign in the run up to the premiere of the feature length film sequel Tamako Love Story the following weekend. 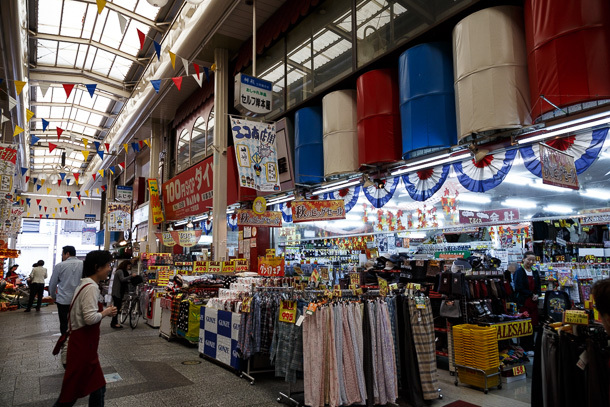 Content from the segment was reused in a national NHK broadcast in the program 情報まるごと (Whole Information) on April 24, with a little additional footage that includes the exchange notes splayed out on a bench in the arcade. I don’t have a video of that, but one blog did save and post a few screen captures from the broadcast. In the original segment, the female anchor and Moriwaki both use the adjective attakai (warm) in describing the environment of the shōtengai, and one individual interviewed uses the word honwaka, onomatopoeia for the sensation of being warm and snug. This is a refrain that comes back again and again throughout the consumer generated media. I observed a handful of Twitter accounts belonging to shops in the arcade interacting with the seichijunrei-butaitanbou community, but the staff at the cafe and bar Hananami had the clear edge, following the developments in the episodes and picking up on the fact that many of the pilgrims met in Kyoto for the weekend and regularly patronized the cafe. This is the first part of the final and most unwieldy, but hopefully most insight generating section of this post, an attempt to curate the large body of digital media that was created as a response to an experience at the Demachi Masugata Shōtengai. To the extent possible, I’ve tried to separate the media into thematic areas that are mutually exclusive and collectively exhaustive. However, the funny thing about creative output is that it doesn’t always feel the need to conform to any of the buckets in which you’d like to put it. Each area has a short explanation of the rubric used to isolate the set and any notable trends. I’ve created my own meta data for each item to help me look for patterns, but it’s not necessary to go through it with a comb unless you’d really like to get down in the weeds. This is the widest sample of images I could pull from the general public, and it gives us some idea of what kinds of things people notice when they visit the arcade. All of these aggregators use some combination of GPS location data, Foursquare defined location check-in, and self-identified location tags to create a grid of photos, all of which come from Instagram. There is more variation between the platforms than you might expect, so it’s useful to consider everything together. 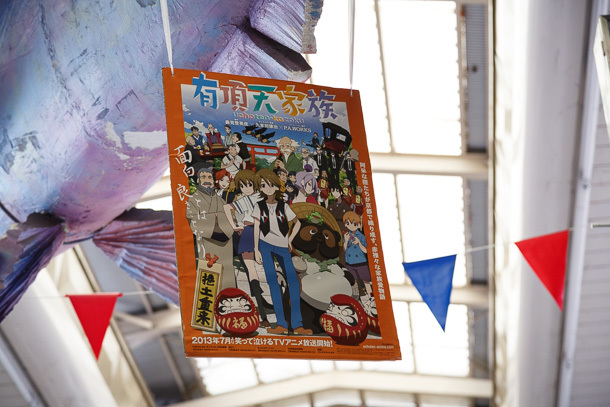 The most common photos are wide shots that capture the whole scene in the arcade, the hand-painted banners, Waka Saba-chan (the mackerel) and large produce displays. There are a few macro shots of individual products, but the large majority seem to skew toward recording the environment. Compared with Instagram, Flickr is a more deliberate process. Rather than many casual photos from a large pool of users, there are fewer users uploading sets of varying size that cover multiple subject types. You see some of the same things as with Instagram, but in addition there are shots that focus on single storefronts, design elements or products. This group of YouTube videos is limited to those that do not appear to be part of a larger work, such as a blog post or presentation. 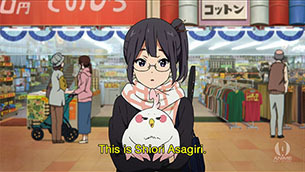 While some may have a relationship to Tamako Market, those included in this group were not explicitly made for the purpose of a pilgrimage. 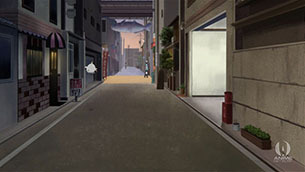 Videos that are part of a multimedia work are in separate sections below, and videos created by seichijunrei-butaitanbou practitioners are under the Anime Pilgrimage main heading. After all of this filtering, the remaining group isn’t very large, though I’m still coming across videos that weren’t previously picked up in my searches. I’ll continue to add them here as I find them. While not a large enough sample to make any generalizations, it’s interesting to see how an individual moves from one focal point to another, and where they choose to linger or zoom in. 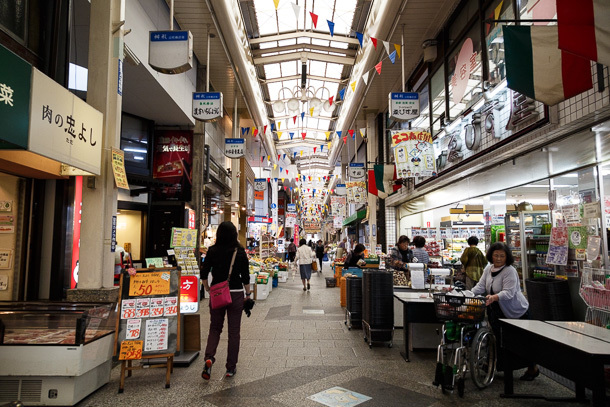 This group is comprised of locals and tourists that visit the arcade without a strong, focused purpose, other than perhaps grocery shopping. 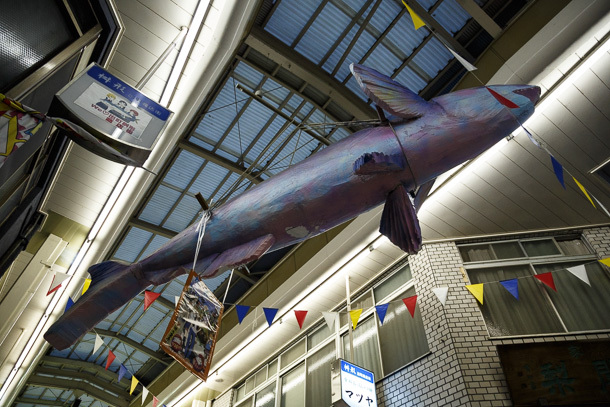 It gives the best sense of reactions to encounters of daily life at Masugata. I was surprised by how frequently the hand-painted banners were mentioned. These are definitely a feature that defines the visual texture of the marketplace. The adjectives warm, lively and kind come up frequently. 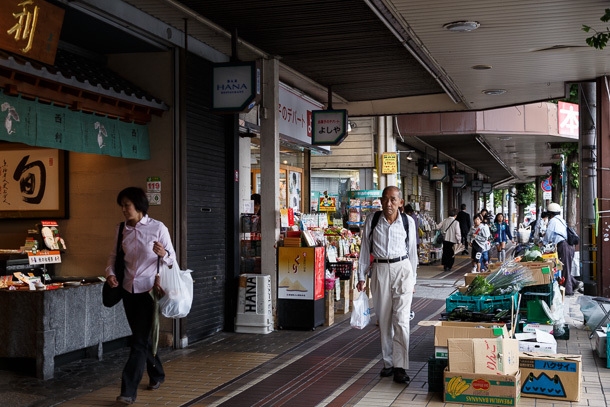 The adjective old-fashioned, and mentions of nostalgia and/or childhood memories, seem to suggest the sense of place that Masugata cultivates is tapping into deep rooted fondness for being part of close-knit community life that becomes more difficult to find over time. 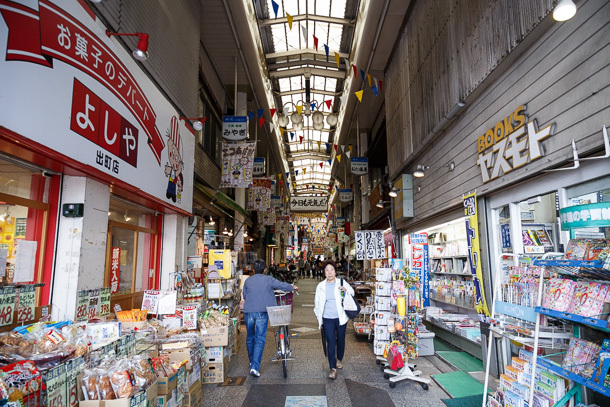 This sense of place is frequently contrasted with the complete lack thereof in contemporary shopping centers, and even the commercialism evident at Kyoto’s famous Nishiki Ichiba (錦市場). While it’s not a surprise that festive events like Tanabata generate their own specific set of media, my fun find in this group were the multiple mentions of a volunteer run haunted house. 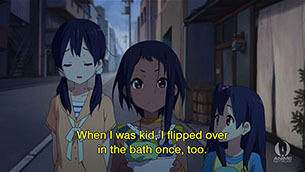 A haunted house figures prominently in the plot of one episode of Tamako Market, but I had originally assumed that was just something created by Kyoto Animation writers. I wasn’t expecting to find what was a real event that was perhaps the seed of that idea. While many people chose to write about Tanabata, the preferred medium for Spirit Festival appears to be video. There are many orphan videos in the YouTube general index (above), and even one of the posts in this section has three lengthy videos embedded. The video from inside the arcade is embedded below. 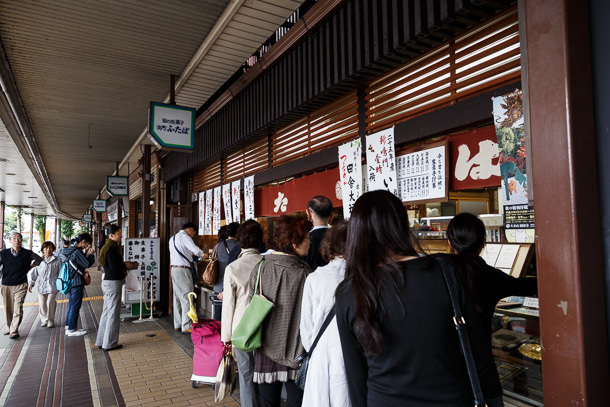 This group visits Masugata with the primary purpose of a sit-down or take-away food encounter, most often mackerel sushi from Masugata-ya (満寿形屋) or mame-mochi from Demachi Futaba (出町ふたば). 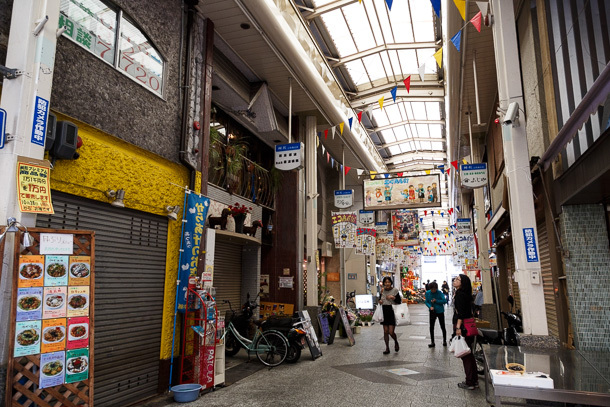 What’s interesting is that they often end up lingering at the shōtengai, making an observation about the environment in the arcade and occasionally expressing surprise at the level of activity. This group latched on to the matters surrounding the promotional character Kamogawa Makoto. There seems to be a lot of guessing as to what was going on behind the scenes, so take these with a grain of salt. This group does NOT self-identify as seichijunrei-butaitanbou community, though may have knowledge of the practice. Does not consider media to be such. 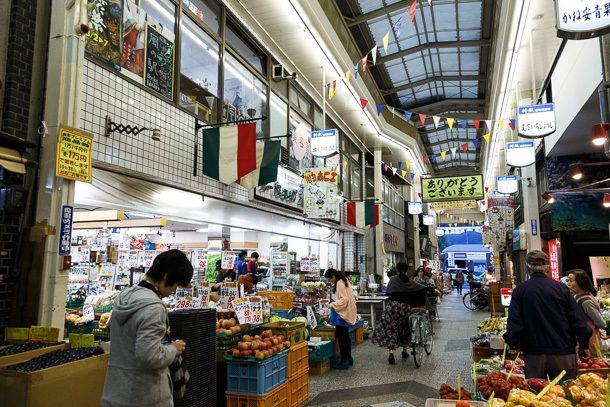 Tamako Market appears to be the initial motivating factor for a visit, but does not necessarily dominate the experience. 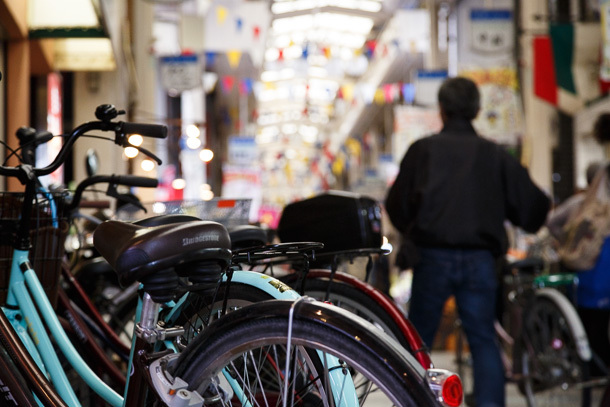 While most of the media about Masugata is in Japanese, a handful of foriegn travelers and residents of Kyoto have also weighed in with their own assessments. The sample isn’t large enough to make any generalizations, but it’s interesting to note that there is a fair amount of overlap with the Japanese media in what gets mentioned. I’ve saved the most specialized and complex group of unintentional urbanists for the end. I wrote a long form explanation of seichijunrei (聖地巡礼)—lit. holy land pilgrimage—and butaitanbou (舞台探訪)—stage exploring, as I understand them, in a separate post that includes my own attempt at butaitanbou for Kyōkai no Kanata. 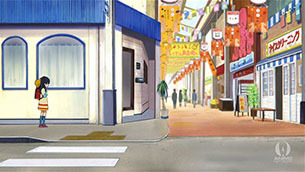 To summarize: seichijunrei is broader, inclusive of just about any activity related to visiting the site of a visual model for manga or anime, while butaitanbou is more specific, usually consisting of side-by-side comparison of frames from the work with a photograph of the real place, cropped to match as closely as possible. Indeed, it is this element of interacting with the creative work that defines the approach in almost all of these contributors’ blogs, photos and videos. Where it becomes insight generating for me is when I see how this ultra-focused attention to detail leads them to make observations that often go unnoticed by casual observers about the public spaces they explore. When I analyze animation for my weekly review, as I watch I make notes of what I want to go back and review, potentially take a screen capture and ultimately write about in the post. It’s not uncommon at all for me to finish my own effort, then compare it to some of the butaitanbou posts that come out and find the authors have included many things that I missed or for which I just didn’t understand the significance. I think it goes beyond the language and cultural hurdles I have to jump to get to the root of the material. The butaitanbou practitioners’ focused and persistent practice enables them to hone a very keen ability to absorb and understand large amounts of information about an urban scene in real time. Observing their work and talking with them helps me learn how to interpret more of what I see, whether that’s in anime or just walking down the street. For anyone who is reading this and finds their work indexed below, I want to stress that this is not a competitive ranking. There is so much material to process here that the only way to begin to understand it was to categorize it in a way that reflects objective differences that result from various levels of interest, access to the sites, and resources like time and money for making the trips and doing the analysis. If you think your work has been mischaracterized or omitted, please let me know so that I can take another look. I’ll buy you a drink at Hananami the next time I’m in Kyoto, by way of apology. This index is arranged by metaphorical distance from the core butaitanbou practice. GROUP A is the most highly engaged, moving to more and more casual as you go down the list. For GROUP A I’ve made a few notes about some of the individual contributors because they represent the most focused case studies by which to understand the practice. In full disclosure, some of these folks have become good acquaintances and friends. For GROUP B and GROUP D I’ve generally not included metadata on individual contributors because the vast majority of the media is united by the singular priority of visiting Demachi Masugata Shōtengai for butaitanbou analysis. Describing the nuances that distinguish each contributor’s work would enter a level of esotericism beyond the scope of this post. Perhaps another day, though! GROUP E through GROUP G are casual seichijunrei. Self-identifies as butaitanbou community. Very high level of engagement. Kobaya is unique even among this group, as he is the only contributor that exclusively uses video. The videos are quite popular and often well-known beyond the butaitanbou community. Despite the notoriety, Kobaya is always humble and friendly. Approach prioritizes quality over quantity. Lidges generally waits for several episodes of a show to air and chooses a representative sample of the shots to present a highly polished summary of the stage with background notes and commentary. He is also a very gifted photographer. Nobu posts less frequently than many peers, but always with the highest attention to detail, providing extensive background notes and commentary. Ebisu is a force of nature. 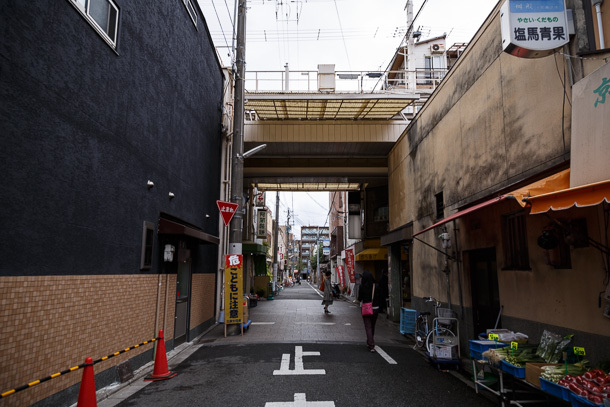 A Kyoto local, he is heavily invested in butaitanbou activity for any anime that use locations in the city as background models, sometimes covering an entire season with a weekly post for each episode. He is also warm hearted and gregarious, frequently serving as something like an ambassador for Kansai area seichijunrei, welcoming out-of-town visitors and organizing events. Ebisu is one of the first people in the butaitanbou community that I communicated with, and I’ve very much enjoyed keeping in touch from time to time. Endosu’s approach involves extreme attention to minutiae, with long (but always interesting) explanations of deep background details. Most notably, tracked down the identity of many of the records that were drawn into the background art or played for patrons at the cafe in the arcade, Hoshi to Piero. This blogger frequently deviates from the butaitanbou formula of screen capture plus photo, but what I really appreciated was his attention to daily life in the arcade, stopping by after hours to observe things like new banners being prepared and hoisted into the rafters, as well as the hubbub of the seichijunrei visitors. Gromit goes beyond the butaitanbou parameters and often shoots pictures of other interesting aspects of the arcade and the neighborhood around it. He also frequently retweets things I share. Thank you Gromit! Self-identifies as or interacts with seichijunrei-butaitanbou community. Moderate to high engagement level. Does not have a Masugata post, but was involved in Tamako Market butaitanbou discussion and posted on Fujinomori stage. 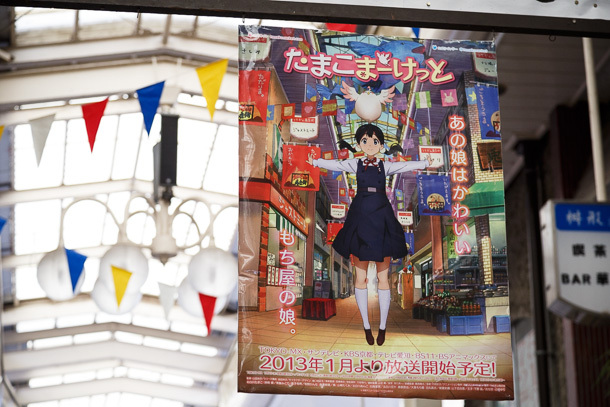 Subsequent to Tamako Market, became a very active blogger and member of butaitanbou community. Self-identifies as or interacts with seichijunrei/butaitanbou community. Engagement moderate to high, limited to Twitter and photo/video sharing. Not having a butaitanbou blog didn’t limit this contributor from very high levels of engagement. Most famously, he live tweeted a 2am pilgrimage immediately following one of the episodes (Tamako Market had a very late night time slot in Kansai). Self-identifies as seichijunrei-butaitanbou practitioner (based on preponderance of mentions), but I am unable to determine engagement level in seichijunrei-butaitanbou community. May interact with the community in other forums, such as bulletin boards and mixi. Does NOT self-identify as active member of seichijunrei-butaitanbou community (based on relatively low frequency of mentions) but is aware of the practice, practices either seldom or occasionally, and identifies media as such. Bloggers with Twitter accounts do not appear to interact with the main community in that forum. The most unexpected aspect of this group to me was its size. Most of my interactions are with the core butaitanbou community, so I wasn’t aware of how many casual practitioners were out there until I began searching broadly. That’s a lot of information to digest. I have the feeling that I’ll be able to come back to it over many iterations and find new sides to it each time. However, if there is one thing that comes through clearly in all of these bits of data, it is that Demachi Masugata Shōtengai has preserved and nurtured a very precious way of life that is very difficult, if not impossible, to manufacture by edict or money. It can only be allowed to grow and become rich with time. The best urban policy is that which empowers the community to make that happen. 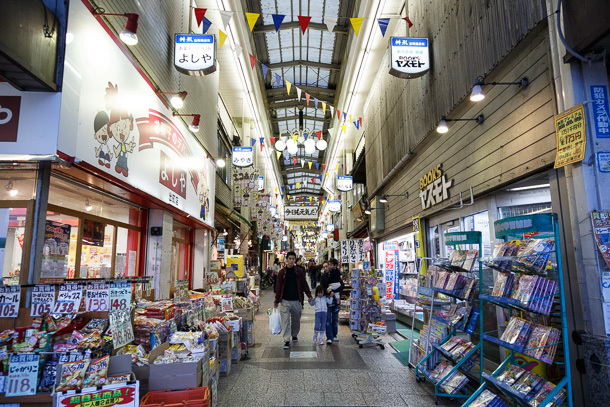 Tamako Market, while it clearly raised the profile of this unique arcade beyond its local community, did not create this environment either. 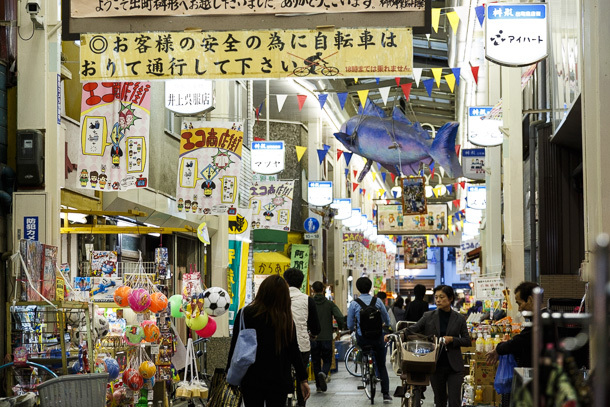 It was because Masugata was already working very hard to create that warm and friendly atmosphere that it was able to provide such an experience to all of these visitors and capitalize on the notoriety. For some time, I’ve thought that I would like to, at some point, live and work in Japan, particularly for the opportunity to study its rich urban environments. Until recently, that really just meant one place: Tokyo. The capital is where most of my network lives and is what I know best. 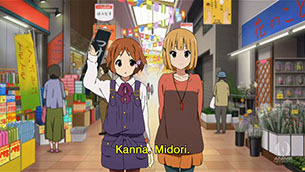 However, beginning with Tamako Market and continuing through Uchōten Kazoku, Kyōsōgiga and Inari, Konkon, Koi Iroha, anime over the past year and a half have been pulling my thoughts strongly west to the ancient capital. Stepping back to think about my 2013 Fall visit and coming out of my deep immersion in this little project, it’s apparent how much I had come to love Kyoto over that time. Not shrine and temple Kyoto (though those are very meaningful too), but the Kyoto inside a place like Masugata, where it’s always a great day.